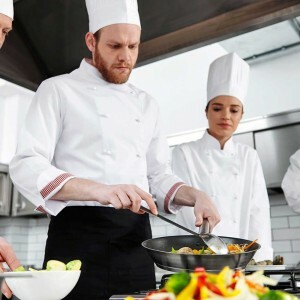 Tips for Choosing the Right Employee Uniforms for Your Restaurant | Ace Uniform Services, Inc.
Are you happy with your restaurant’s employee uniforms? It may be time for an upgrade! When choosing employee uniforms, you want the clothing that your representatives wear to be professional, clean, and comfortable. They should be recognizable and make your customers feel like they are working with reliable people and a dependable, clean, and safe business. Check out these tips for choosing the right uniforms for your restaurant. The clothing that your employees wear should reflect the culture, image, and mission of your brand. Starting with the style, should your uniforms relay a message of a casual atmosphere or a formal environment? Whichever is more indicative of your restaurant, the uniforms should be professional, crisp, and clean. Polo shirts are a great way to bridge the gap between a casual and more formal look. In addition, using a darker color palette gives you more freedom to accessorize and is easier for creating consistency. Even if you choose bright colors, they should also reflect your brand and the colors associated with your logo or other marketing materials. Your employee uniforms need to be neat and clean at all times. Therefore, remember to consider the performance and durability of your clothing choices. Consider using washable and stain resistant materials like a poly blend, which will keep its shape better after multiple wears. To help with this, supply your employees with at least two options per article of clothing. Using high-quality materials means that you’ll spend less money, in the long run, replacing the uniforms. If your employees are on their feet through much of the day or working in a hot environment, use materials that are breathable and absorb sweat. It’s best to avoid materials that will cling like nylon. Consider using a different style of uniform for employees that have different duties within the business. For example, those who work in the front of the house will wear more formal looks while employees who work in the back or away from customers will wear more casual uniforms. In addition, think of any accessories that your employees wear as part of the uniform. Hats, aprons, gloves, and even scarves should match the overall style and colors of the uniform. This entry was posted on Friday, March 2nd, 2018	at 1:55 pm	. You can follow any responses to this entry through the RSS 2.0	feed. Both comments and pings are currently closed.